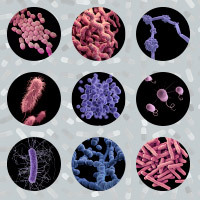 These more common drug-resistant microbes already infect over 2 million Americans annually, resulting in 23,000 deaths, according to the Centers for Disease Control and Prevention. 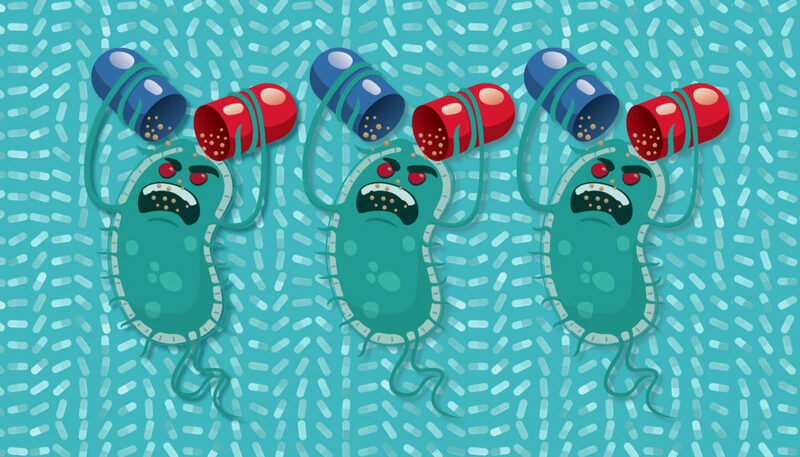 Microbes resistant to healthcare’s armamentarium of antibiotics and other antimicrobials are rapidly pushing up the costs and risks of treatment, as doctors must prescribe last-resort drugs that are both expensive and that, when used, risk inducing further resistance. And while pharmaceutical researchers may be able to develop new antibiotics, bacteria are going to keep evolving, at the rate of one generation every 30 minutes or so, and winning the resistance war. But new research at Washington State University and elsewhere suggests that broad-spectrum antibiotics might be at least partially replaced with a multifold strategy: a variety of more narrowly targeted drugs, including one strategy that exploits the power of the cell being attacked to fight off infection. Additionally, experts at WSU, along with their colleagues at the Washington State Department of Health, say that one of the main strategies for combating antimicrobial resistance is through stewardship of the current suite of antimicrobials, meaning they must be used much more judiciously. Another is deceptively simple: to improve our personal hygiene and food handling practices and thus block the transmission of infectious bacteria. WSU pathologist Guy Palmer compares antimicrobial resistance—AMR—to a car wreck. We sit up and notice when a plane crashes, no matter how rare that is, just as we do when a scary disease outbreak, like the 2014–15 spread of Ebola, jolts Americans into awareness about our vulnerability to the spread of infectious diseases. Car crashes, though, while taking far more lives than do planes, barely register on our public health radar. Doug Call (’87, ’97 PhD Zool. ), a microbiologist and a colleague of Palmer’s at WSU’s Paul G. Allen School for Global Animal Health, worries that we don’t do enough public education regarding microbes and their health consequences. Where, he asks, is there room in the public school curriculum to teach kids how to prevent the spread of microbes through such basics as thorough hand washing and safe food handling? Call, Palmer, Davis, and their public-health colleagues in the Washington State Department of Health, all agree that blocking transmission is the essential frontline defense that must be reinforced. And while the CDC funds surveillance and infection prevention programs for public health agencies, the “last mile” problem—how you and I behave in the face of spreading AMR—is much harder to deal with. And then there’s the fact that we are, like it or not, a global community. What happens in Scotland or Tanzania affects us here—and no border will ever keep microbes out. They arrive on humans, sure, but also on food and any evenly remotely hospitable-to-microbes surface. It is, as Call, Palmer, and others confronting AMR say, the very definition of a “wicked” problem: deeply complex and with no simple solution. The first antibiotic was in fact a chemical extracted in 1928 from Penicillium, a common fungus. By the end of the second world war, resistance to penicillin was already resulting in untreatable infections. That’s because whenever bacteria (and, for that matter, viruses, fungi, and other microbes) encounter antimicrobial chemicals, whether human-made or otherwise, they either die or evolve. The ones that survive pass on their resistance genes to their kin. Bacteria have a distinct evolutionary advantage over humans, inasmuch as they reproduce, and thus adapt to changes in their environment, very quickly. Bacteria also exchange genes via plasmids—tiny bundles of genetic material that can be shared with neighboring bacteria—in a process called horizontal gene transfer. Bacteria have several methods of resisting the chemicals designed to kill them. They build protective walls around the sites where antibacterial drugs are designed to latch on to the organism and disrupt reproduction or metabolism. Or they have pumps that sense the presence of a toxic compound, and pump it right back out again. While AMR is naturally occurring, it has spread rapidly in recent decades due to the widespread use of antibiotics in human and animal healthcare. Indeed, as researchers from both the WSU College of Veterinary Medicine and Washington Department of Health say, there is much finger pointing: Is it the use of antibiotics in dairies and other livestock production situations that is responsible for the spread, or is the lack of stewardship and infection prevention in health-care facilities the cause? The “wicked” answer is that AMR is a result of both, and much more. AMR is, say experts, a “one health” problem that involves humans, animals, and the environment. While use of antibiotics in the livestock industry varies, consumer demand has resulted in several companies, such as Pizza Hut, Costco, and Walmart, to stop selling chicken that’s been exposed to antibiotics. As Call says, foodborne illness is not a matter of if, but of when. That’s why restaurant workers must be specially trained to handle and prepare food safely—a training that would no doubt benefit everyone who handles and prepares food. “Attention to bacterial transmission is probably orders-of-magnitude more important in hospitals where the most vulnerable patients are at risk,” he says. For most people, AMR is like the car wreck that happens to someone else. Sad, but no reason to change our personal behavior. Jon Yoder, an economist at WSU, studies exactly that kind of situation as he looks for ways to motivate people to change. Economics, as Yoder points out, is a social science focused on the reasons people do what we do. One of the reasons most of us don’t do much about AMR is because the costs associated with AMR are “external.” If you don’t personally pay the direct cost of antibiotic use, you’re not likely to reconsider the way you use them. It’s somebody else’s problem. For example, if I use antibiotics to treat a cold, I’ve done something that promotes the spread of resistance genes—and that’s completely ineffective because of course the common cold is caused by a virus. But I may not have to pay the price; rather, the person in the next hospital bed over may be the one to contract an untreatable infection. Likewise, the use of personal care products containing triclosan, an antibacterial in thousands of products, externalizes the cost of resistance by polluting the commons, the shared resources we all depend on for life. Yoder is looking for ways to create incentives that will result in people recalculating the way they use antibiotics. Regulation and taxes are two common solutions. As with carbon emissions that contribute to global warming, it might be possible to tax antibiotic use—in essence raising the price of treatment—so they are used less frequently. But, Yoder points out, taxation and regulation are fairly blunt instruments with ethical challenges, especially where access to healthcare is limited. The real world is much more complicated. Take the use of antibiotics in Kibera, for instance. Kibera, on the outskirts of Nairobi, Kenya, is one of the world’s largest “informal communities.” “A slum, in other words,” Call says. He and other WSU researchers have spent time there, trying to get a handle on the microbial situation. With 77,000 people per square kilometer and sharing a very limited number of public toilets, there is often no choice except to dispose of waste in the alleyways between buildings. Such conditions are ideal for promoting disease transmission and ramping up the demand for antibiotics. In many parts of the world, including Kenya, access to antibiotics is restricted only by cost. But, as Call says, who’s to say that the use of such drugs is inappropriate when your health may depend on them? Taxing or regulating the use of antibiotics in such situations would be inhumane. As Call stresses, the solution is blocking transmission, making the use of antibiotics unnecessary. Sara Podczervinski is an infection preventionist with the Washington State Department of Health, and blocking the transmission of disease-causing microbes is both her work and her passion. Where once infection prevention was largely the sole purview of hospitals, the practice is spreading to long-term care and ambulatory surgery facilities, dialysis centers, and indeed every aspect of healthcare. “You have to think beyond the hospital walls,” she says. But you have to think about the walls, too, and that’s just what is happening in facility design. Facility planning now involves not just architects but their clients: the doctors, nurses, and support staff who need quick and efficient hygiene practices. Stewardship of antibiotics and surveillance of where AMR-associated infections take place are the purview of Podczervinski’s DOH colleagues Marisa D’Angeli and Kelly Kauber (’08 Ani. Sci., ’11 Biol.). Stewardship, Kauber says, is an effort to conserve the efficacy of antibiotics by making sure they are only used when really needed. This requires a “one health” approach because, says D’Angeli, “we don’t know whether the biggest problem is coming from antibiotic use in humans, in animals, from pollution, from people throwing their antibiotics down the toilet—but we really want to move the needle in the right direction everywhere antibiotics are used. Drugs that target specific diseases may be a powerful tool in blocking the transmission of disease. As currently designed, broad-spectrum antibiotics kill bad bugs but they may also take down the good ones, too. “It’s like using a sledgehammer when you need a scalpel,” says D’Angeli. That can wreak havoc with a patient’s gut microbiota, leaving, for instance, the notorious Clostridium difficile. A normal member of the gut biota, when left on its own it can cause unrelenting and sometimes fatal diarrhea and other complications. Researchers in the school recognize that humans are animals and that infectious diseases such as Salmonella are often “zoonotic,” transmissible from animal to human and human to animal. Influenza is probably the most well-known example of a zoonotic disease, harbored in poultry, swine, or other animals before jumping to humans. Kawula’s lab focuses on intracellular diseases, such as salmonella, chlamydia, listeria, and many others that actually cause infection by first invading host cells. A staph infection, by contrast, may cause a skin abscess but it’s growing between the cells, not within them. “Intracellular pathogens can take advantage of a host cell environment,” Kawula says, by disabling a cell’s normal antimicrobial defenses. Kawula and his colleagues specifically work on ways of countering the attacks of certain infectious agents on macrophages. “Macrophages are a type of cell that are there to control infection. They have a lot of antimicrobial properties. They basically rip the bacteria to shreds, killing it so it doesn’t cause any more disease,” he says. Bacteria, though, have figured out how to infect macrophages, and there is a long list of nasty diseases that are “recalcitrant to treatment” that could potentially be stopped in their tracks if we knew how to target them. Kawula’s strategy is not to directly attack the infecting microbe but to use the host cell’s resources to kill the invading bacteria. Bacteria rely on their host cells for food. If a compound could be targeted to a particular aspect of the host cell’s metabolism that, in turn, cuts off supply of an essential nutrient the bacteria requires, then the invader can no longer thrive and reproduce. End of infection. This is a relatively new area of research called “host therapeutics.” In Kawula’s case, he says he and his team started out trying to understand how an invading bacterium manipulates the environment inside a host cell. Researchers elsewhere are exploring the possibility of using phages, those bacteria-destroying viruses that are a natural part of an organism’s immune system, to treat disease. And new vaccines are also a possible avenue of defense. But all agree that, as naively simple as it sounds, good hygiene is one of the primary ways of keeping organisms with AMR genes from spreading. Antibacterial soaps are not needed for good hygiene, says Podczervinski. They may even hurt more than help, potentially promoting the spread of resistance. “Where you’re going to get the most prevention is in the actual physical act of washing your hands and rubbing off germs. You have to make sure you rub your hands together with soap and water for a good 15–30 seconds. And you have to reach those areas that sometimes gets missed,” like our thumbs and fingertips. “When we do the black light test [which reveals the presence of bacteria] you’ll see them in the cuticles, or the nail beds,” she says. In other words, don’t underestimate the power of hygiene, the original defense against infectious disease, to slow the spread of those resistant microbes.